An enthusiastic and appreciative audience packed the Delaware Valley University’s Life Sciences Auditorium for the Bucks County Symphony Orchestra’s first concert of the 2017-2018 season on October 21. The BCSO introduced its new Assistant Conductor, Sebastian Grand, who opened the concert by leading the orchestra in a stirring rendition of Rossini’s William Tell Overture. 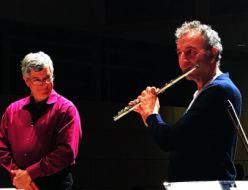 Extraordinary French flutist Jean Ferrandis enchanted the audience with his performance of Mozart’s Flute Concerto in G with the Symphony, under the direction of Music Director Gary S. Fagin. Maestro Fagin and the BCSO concluded the concert with Cèsar Franck’s ever-popular Symphony in D Minor.